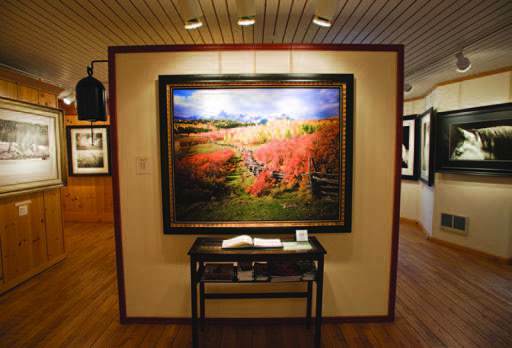 In Jackson Hole galleries, photography is fine art. And we don’t mean just wildlife and landscape shots (but those are gorgeous). Vancouver-based photographer Danny Singer is best known for his Main Street series, which includes photographs of small-town main streets from Buchanan, Saskatchewan, to Hartney, Manitoba; Wing, North Dakota; and Paducah, Texas. “His work resonates with clientele whose collections already include [Tom] Mangelsen’s wildlife photographs or work by Jeff Koons,” says Shari Brownfield, the director of Heather James Fine Art, which represents Singer in Jackson Hole. WHETHER SEEN IN a postcard, a painting, or in person, Mormon Row’s historic Moulton Barn and the dramatic rise of the Tetons behind its gabled roof are familiar to valley residents and visitors alike. For as oft-photographed as the century-old barn is today, though, that wasn’t always the case. In the 1960s, local photographer Abi Garaman was one of the first artists to sell images of the Moulton Barn. Two photographs of the barn, The Glowing Past and Once Upon A Time, in particular launched Garaman’s career. The images were included in the collection of the Professional Photographers of America. That group went on to honor Garaman with the title Master Photographer. Brownfield has seen images like Singer’s resonate with clientele that range from local collectors of Thomas D. Mangelsen’s wildlife imagery to visitors from New York and Chicago. One Heather James client with a notable Jeff Koons collection is drawn to Singer’s work. “I think people are slowly being introduced to photography as a medium that is acceptable in the art world. 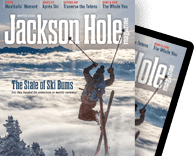 Just like fine art prints, etching, lithographs, and silk screens all had to find their place in the fine art world, photography has found its way.” But, in finding its way forward here in Jackson Hole, it hasn’t forgotten its roots. 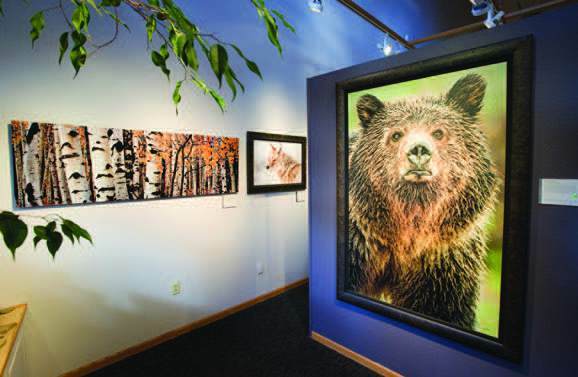 ONE BLOCK FROM Heather James and three hundred feet from each other on Cache Street, both Brookover Gallery and Mangelsen–Images of Nature Gallery showcase landscape and wildlife photography. Photographer David Brookover opened his two-story gallery thirteen years ago. His work is of classic landscape subjects but printed in a variety of different styles, including platinum palladium on gampi and kozo papers, black-and-white silver gelatin, photogravure, and bromoil. Brookover says the latter, a cross between painting and photography, is the most labor-intensive. Each bromoil print can take nearly two months to produce. “When we hung our first traditional silver-gelatin print in 2002, a slow shift began to take place,” Brookover says. “In 2007, we produced very large platinum palladium prints on exotic Japanese papers and that definitely signaled a change of direction in the photography art-collector world. Collectors took note, and we have not looked back. Since then, we have introduced bromoil and photogravure prints, too. The majority of our sales are purchased by astute collectors wishing to acquire very low edition runs.” Brookover says most collectors are purchasing prints ranging in price from $5,000 to $35,000. “When I moved here in 2001 there was only one contemporary gallery, which was on Center Street. Times have changed indeed. A lot of the newer gallery owners, along with interior design stores, have definitely brought and welcomed fresh ideas and good energy to the downtown,” he says. Because Brookover’s printing processes are as impressive as the breadth of his work—he shoots Japanese landscapes, local aspens and wildlife, and many things in between—the photographer is often at the gallery. With his dog, Mocha, at his side, Brookover takes the time to describe his work to visitors. On the gallery’s first floor, there’s an explanatory DVD almost always playing. Although Mangelsen has been taking, printing, and selling photographs for forty years, modern printing processes and materials have improved their collectivity. “Work printed today has longevity,” Turner says. Just what any collector of most anything wants to hear. A design studio shows how fine art photography can look in your home. WRJ Design Associates cofounders Rush Jenkins and Klaus Baer are always on the lookout for great design, and their idea of design is holistic. They’ll find everything from the perfect Arpin fabric for your windows to an attention-grabbing Ralph Lauren Home dining room table. The design duo have also included fine art among their offerings since they opened in spring 2012. Fine art photographers represented by WRJ include Taylor Glenn and Edward Riddell. Glenn’s photography captures the beauty of the wildlife and landscapes throughout the region and his travels, while Riddell’s photography captures a simple, “quiet beauty,” as he describes it.